It wasn’t too long ago that the Pope was widely considered by the Protestant world to be the Antichrist. Not just “antichrist”, but THE Antichrist, big “A”, long horns, pit of hell stuff. But then the Pope in those days was slaughtering Protestants and building huge cathedrals on the false hopes of ignorant peasants enslaved to a false gospel. Of course when I say that it wasn’t too long ago, I mean it was just a couple of centuries, but that really shouldn’t be a huge period of time to properly historically-minded people who don’t think that the world began on the day they were born. Pope John Paul II was a different kind of pope, it seems to me. It’s all been said, so I won’t rehearse it here, but he championed freedom, life and values. He was more responsible for the downfall of communism than anyone else in the world with the possible exception of Ronald Reagan. He was a great man. Of course, being a great man doesn’t get you into heaven. And in regard to Catholics, I’ve often said that while there are certainly individual Roman Catholics who may truly trust Jesus as their Lord and savior, it seemed impossible to me that someone could be well-versed in Catholic theology and yet be saved, with its works requirement for salvation, its deification of Mary and other saints, its many additions to Scripture, and its bastardization of the Lord’s Supper, the one sacrament which ought to be a continuing part of every Christian’s life. Big issues, these, and how could you be said to worship the one true God and at the same time give some of that glory to Mary? How could a man who truly knew and believed these doctrines be said to trust only in Jesus Christ for his salvation? And who would be more well-versed in Roman Catholic doctrine than the Pope? Just as being a great man doesn’t get you into heaven, though, neither does accuracy of doctrine. Being a good Christian doesn’t mean being a good scholar. All Christians ought to be scholars as they are able, but it is faith like a little child which is the instrument by which Christ’s redemption is applied to us, and only that sacrifice and death can “get us into heaven”. Did Pope John Paul II have that faith? How on earth are we to know? For all the RC’s faults, they believe in the trinity, the deity of Christ, and his substitutionary death on the cross for our sins. They believe that it is necessary that I have faith in that death for salvation. They believe in the afterlife, heaven and hell, even if they did add a third, utterly unbiblical state, purgatory. All of this, it seems to me, add up to the core of the gospel, even if they have dumped a truckload of other garbage on top of those beautiful doctrines, obscuring them to millions. I’m new to this whole “blog” thing, but I will try my best to leave an intelligent comment. I was raised “Protestant” (although now as an adult, I’m unclear as to what that really means except anti-Catholic). Through my own spiritual journey, I now find myself in the Roman Catholic Church. I’m not a theologian, nor to I pretend to have all of the answers, but I find this entire paragraph highly disturbing and very similar to what I was “taught” about Catholicism as a child. Could you explain further these horrific theologies that you refer to and where you are getting this information? The above link is to the Catholic catechism which affirms the doctrines, both good and horrific of the Roman church. I’m sorry that your previous Protestant church didn’t teach you anything. The term “Protestant” refers to those who “protested” the abuses of the Roman Catholic Church, specifically (at the time) the selling of indulgences, which was a practice by which money could be given to the church in exchange for merit being given to dead relatives who would then escape hell. Just one example of a failure to rest entirely in Christ for our salvation. Mary and other saints are viewed as sharing the work of redemption with Christ. Therefore, in your theology, some of the glory which is rightfully only Christ’s is transferred to Mary and other saints. Tradition is viewed as equal to Scripture. In fact, since tradition falls into the role of interpreting Scripture, it is frequently more important, since you can only really know what Scripture says by interpreting it through tradition. The Mass teaches that the bread actually becomes the body and the wine becomes the blood of Christ, despite the fact that Jesus, when teaching us what it means that he is the bread of life, tells us that “the flesh profits nothing”. The pope is viewed as infallible, also transferring to him a glory that is only due to God. Thus, the Catholic Church still views as canonical (authoritative) such statements as the acceptability of torturing heretics (Protestants) or others to gain confessions from them. The Inquisition was based on canon law. The RCC burned men like John Huss at the stake for the crime of making the Bible available to the common people. They would have killed Wycliffe too if they could have. They tried very hard to forcefully exterminate every Protestant (look up the 30 Years War, Albigensians, Waldensans, Huguenots, St. Bartholomews Day Massacre, Bloody Mary, etc etc etc), so that today if they had their wish you would not have the option of being anything other than Roman Catholic. A lot of people died so that you could have the choice (most of them Protestants). So again, I’m sorry you didn’t get taught anything. But I’d strongly encourage you to start educating yourself, because there are very serious things at stake. Thank you very much for your response. It reminded me of one of the reasons why I left the “Protestant” church. Everything is dumbed down, and many “faithful” speak down to you if they feel your faith education is not up to par. Perhaps I didn’t showcase my knowlege well in my last comment, but everything you told me in your response is not news to me. I’m very aware of how the “Protestant” church came to be. It is obvious from its name that it was in some sort of “Protest”. However, there are now so many denominations who carry their own claims of exclusive knowledge of how to interpret scripture, that I no longer believe that “Protestant” is a valid term. As for Mary and other saints, I will agree with you that there is a perversion of their roles in many Catholic circles. However, Mary and other saints are quite often viewed as intercessors to Christ. Protestants look to others as well to intercede for them with Christ. Tradition does not exist in Protestant churches, because there is none. There are no roots. On the bright side of this, there are also no damaged roots like the Catholic faith carries around. The persecution of Protestants by Catholics is a well documented historical fact. There is no justification for this treatment. However if you look in history there are numerous examples of persecution of all types of people. Whoever has power always persecutes those without power. Transubstantiation is the Catholic term for the conversion of the body and blood of Christ. I’ve had many wrestling thoughts on this throughout my 8 years as a Catholic. However I believe that there is more compelling truth to this if you look at scripture in its cultural and historical context and really analyze Christ’s new covenant with his people. But I won’t go into this here – we will just have to agree to disagree. The infallibility of the Pope is I believe the number one point that all Protestants make when telling of the horrors of the Catholic church. Yet what I find so amazing is how pastors are viewed in almost the same light in Protestant churches. Who is it in your faith that interprets the scriptures? Pastors are held to such a high office and many of them do not realize the power they wield. As a lay person who works 50 – 60 hours a week, a mother of two and a devoted wife, I do not have the luxury of time to delve into scripture and theology as someone in ministry does. Perhaps I should have stayed a “blog lurker” and I can tell you that is probably where I will go. I just had to comment on you initial post because I found it so offensive and the fact that others found it “humble” and “foundationall sound”. It was interesting that your response to me was much more guarded. I have no idea if Pope John Paul II is in heaven, it is out of my realm of knowledge. However, I do know that there have been few others in my time who have been such an example of Christ here on earth. He was a champion of the Word and of our Saviour Jesus. I feel blessed to have been able to see his witness. Here are some resources I found on the web that can explain Catholic beliefs much better than I can (there is a reason I am not an apologist). Where does your infallibility come from to discern who are true apostles and who are the false “apostles” that Paul speaks of? Protestants may not have a doctrine of infallibility, but actions are much louder than words and every protestant I have ever met dismisses Catholics the same as you do as though Protestant teachings are infallible. Quoting scripture from a canonized Bible to talk of the false witness of other Christians is absurd. I’m done now with throwing myself to the wolves – Protestants smell meat and pounce and spew the same things I have heard all my life to defend themselves. Isn’t there a new argument out there? I used to badger Catholics the same as you. Then I felt I owed it to them to understand the very things I hounded on them for. It was that journey that led me out of Protestantism into Catholicism. We could spend all day bemoaning the shortcomings of both Protestants and Catholics. I for one have been there, suffered through it and found my way to the Truth. Slow down, Patricia. I think you are missing the overall tone of Matt’s post. Further, let’s not forget who anathematized whom. The Protestants have never held a council to declare that Catholics are going to hell. Yet, I, as a Reformed believer, have been officially anathematized by the Council of Trent. So, why is it ok for the Catholics to call our theology horrific, yet we cannot return fire without being considered rabid? I have a lot of respect for the Roman Church, I really do, but I also think it is quite unfair to dismiss the protests of the Reformers as completely irrelevant, misguided, and reactionary. Rome does deserve a fair audience, but so do we. I also think you are right on when you say that the term “Protestant” has very little meaning today. I also think that many so called Protestant churches deserve your reproach. 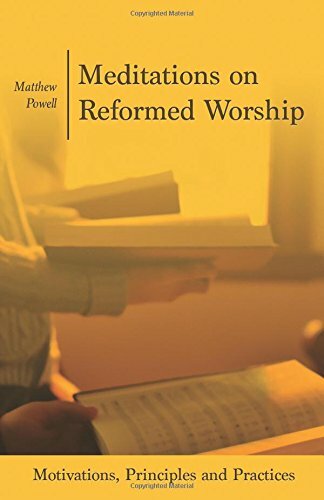 I would encourage you, if you have not already done so, to read the Reformers themselves (Calvin, Luther, Melancthon, Zwingli, etc.). You were the one who said you were ignorant, in your comments, and that you didn’t really get taught much as a Protestant. So I didn’t assume anything. I don’t know you any other way than by what you said- that’s what I’m responding to. You can take offense if you like, but I just based my comments on what you said. This article was meant as a conciliation to a church that has spent hundreds of years killing protestants. OK, so the Protestants occasionally persecuted people too. But it was never the official doctrine of any branch of Protestantism and it was never anywhere on the scale of the Catholic depradations. The doctrines of the Catholic church that led to all that killing and torture have never been renounced. They are still the official policy of the RCC. They just lack the power to exercise it. But really, I never intended to get in a big argument about Catholic doctrine. We can do that some other time if you like. This was really just intended to say something nice about Pope John Paul. I love your blog. It always makes me thingk. Thanks. Great blog! I found your link from a Razor’s Kiss link. I didn’t think you meant to blog a totally anti-Catholic post though they have influenced our thinking for centuries so it’s no wonder that the emotions come into play. Good critique of the situation. My 2 cents is that the Catholic church has done many bad things and many good things. They’ve been around since Peter. I understand their need for “tradition” during the dark ages to have confession, etc. but too bad that tradition now haunts them with Christian’s Enlightenment. We’re not uneducated hungry masses anymore. The hand-holding is archaic. God Bless the Catholic Church though. A billion people count on the Pope, for right or wrong.